The C programming language is clearly an imperative programming language not designed to be object-oriented. Anyway, the object-oriented approach remains something much more related to the design and mindset more than to syntax. The ChibiOS/HAL is an Hardware Abstraction Layer which design could be considered very object-oriented. We encountered it in almost every article related to ChibiOS but we often ignored its design as it comes with a series of demos which allow to use it easily without a deep knowledge of its internal mechanisms. This article is dedicated to people who want to go in deep and see how stuff works. 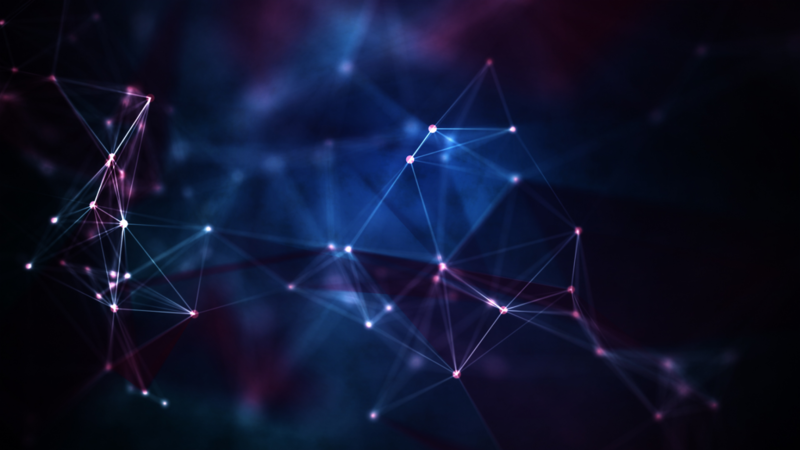 Starting from ChibiOS 3.0, ChibiOS/HAL became essentially a standalone product that is not rigidly attached to the OS and can be used on bare metal or in conjunction with any other RTOS. ChibiOS/HAL provides a hardware abstraction allowing nevertheless a custom use of peripherals. HAL has undergone a lot of changes based on community’s suggestions and after years of upgrades and bug fixes, it has reached a high level of stability, reliability and flexibility. To encapsulate the driver complexities allowing somehow to properly address the hardware-dependent configuration: such implementation allows to cover many different scenarios. To provide an hardware-independent and universal high level API: this ensure that application are portable across different microcontrollers. To ensure an intrinsic optimization and provide and non-polled implementation to make HAL usable in Real Time applications. To support most common peripherals like ADC, CAN, DAC, GPIO, ICU, PWM, SPI, TIM, UART, USB and many others. HAL is organized in a multi-layered way and more precisely it has two layers. The top layer which offers a universal Application Programming Interface (also abbreviated as API) we can directly approach. The low level driver (or LLD) layer which resolves differences across different hardware. We could imagine this architecture as a LEGO wall: we can directly approach only from its top layer and this provide us an universal interface to the underlying low level. The interface remains unchanged in time and across different microcontrollers and this makes application built on top portable across different hardware and easy to maintain in time. The trick is done linking proper LLD drivers depending on underlying microcontroller. 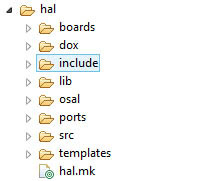 To understand this let’s take a look to the organization of HAL files. HAL is contained inside the folder hal contained in our ChibiOS root directory. What we have called Top Layer is contained inside the two folders include and src. Exploring the first folder we will header files like hal_adc.h, hal_pal.h, hal_pwm.h, … while in the second source files like hal_adc.c, hal_pal.c, hal_pwm.c, … and so on. Such code performs those operations which are common to any hardware. Operations which are hardware dependent are executed calling low level driver API. While there is only one top level layer there are many LLD layers which are related to specific platforms. a folder for each STM32 subfamily which contains the low level drivers specific of that subfamily and the platform.mk (a piece of makefile used to list and link drivers used by that platform). a folder named LLD which contains certain driver which are common across more than a subfamily. What follows is the platform.mk of the STM32F4xx subfamily were we can spot all the LLD used by it. As example F4 uses the ADCv2, CANv1, DACv1 and so on. # Drivers compatible with the platform. The following code snippet has been taken by a demo for STM32 and we can see it contains two switches: the first one is enabled and includes all the code related to Serial Driver, the second one is disabled and excludes all the code related to PWM Driver. * @brief Enables the SERIAL subsystem. * @brief Enables the PWM subsystem. A driver relies on hardware peripheral. To use it we have then to assign a peripheral to the driver and this can be done acting on mcuconf.h. As example in the following code we are assigning USART2 to the Serial Driver. As side note this code has been copied from the MCU configuration header of the original demo for STM32 Nucleo-64 F401RE. * SERIAL driver system settings. Note that is not possible to assign the same peripheral to different driver because this would generate conflict on IRQ management and the project would not compile. As instance, it is not possible to assign USART 2 both to the Serial Driver and UART Driver and trying to do will result in a compile error. In figure 4 the problem windows reports the compile error derived by such operation. The error is due to the tentative to assign the same IRQ line (VectorD8) to two different drivers. Each ChibiOS driver can be enabled or disabled in the halconf.h file and each project has is own HAL configuration header. In the original demos all unused drivers are usually disabled. If you have launched the default demo you should have noticed that we use Serial Driver to print test suite results, and us most likely your project will be a copy of the default one most-likely you will find the SD already enabled. Each driver is represented by a structure and every API associated to a certain driver requires its pointer. As this structure contains almost every information related to driver, API doesn’t require a long list of parameters and moreover this implementation allows multiple instances. As example assigning the STM32 SPI1 to serial driver the SPID1 object would become available. Note that, the driver implementation inumbering is aligned to peripheral numbering: SPI peripheral 1 is associated to SPID1, SPI peripheral 2 is associated to SPID2 and so on. Each API of the a driver starts with the prefix. Function names are camel-case, preprocessor constants uppercase and variables lowercase. 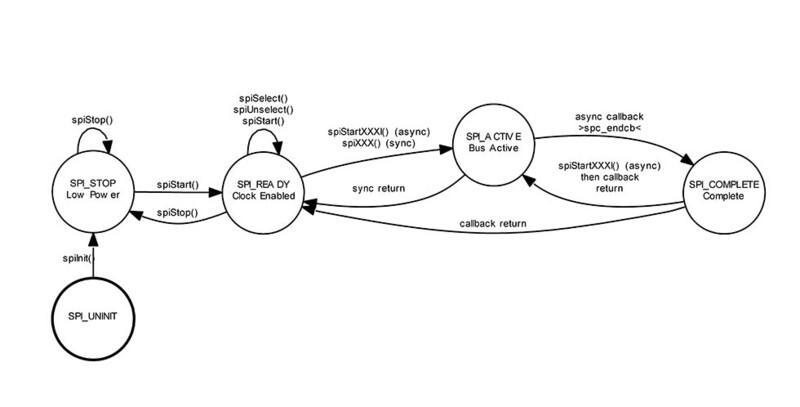 The Finite State Machine for the SPI Driver. Looking at SPI finite state machine, we cannot call function spiStart() on SPID1 if this driver is into the state SPI_UNINIT. * @p boardInit() (usually defined in @p board.c). * configured to require it. If a ChibiOS driver is enabled in the HAL configuration file, it is automatically initialized on HAL initialization. Initialization is related to variable initialization more than on hardware configuration. Before to use it, the a driver shall be properly initialized and configured. This operation is carried out by another function: the start. The following code box reports some start function from different drivers. * @brief Configures and starts the driver. * @param[in] config the architecture-dependent serial driver configuration. * @brief Configures and activates the ADC peripheral. * the implementation the value can be @p NULL. Such functions shall be called at least once by the user application before the real usage. Their purpose is to configure the peripherals and this involves setup of all that hardware configurability. In ChibiOS/HAL every driver except PAL shall be started before to be used. The xxxStart function receives two parameters which are a pointer to the serial driver object we want to start (e.g. &SD1, &SPI3, &PWM7 or whatever is the driver we are going to use) and a pointer to a structure which represent the related configuration. This structure contains all the dependencies which are strictly related to the underlying hardware. This means that moving from a STM32 family to another which has a different underlying hardware we most likely have to apply some changes to these configuration structures. Starting a driver we need a pointer to it and a pointer to its configuration structure. This structure contains all the HW dependencies and has to been reviewed if we port our application on a different microcontroller. The start function usually enables peripheral clock. In certain application (especially those addressed to low power) it is undesidered to keep a peripheral clocked when it is not used. Because of that there is another function we could use to stop the driver and stop the peripheral clock: the stop. * @brief Stops the driver. * the message @p MSG_RESET. * @brief Deactivates the SPI peripheral. * @brief Deactivates the ADC peripheral. This function can be called by the user application when the peripheral is unnecessary. It is almost intuitive that after a stop we need a new start to be able to use again the driver. we start the driver when needed configuring it. we do some operations on that driver. we stop it as soon as it has completed operations. This offers advantage especially if peripheral is actually used in a small slice of the whole time amount of execution time. It is possible to stop a driver to reduce hardware power consumption when peripheral is used for a small percentage of execution time. After being stopped a the driver shall be re-started to be used again. An approach similar to Start-Do-Stop can be used is used when we need to change driver configuration on-the-fly. In such scenario we can start peripheral multiple time with different configuration. Note that stop is not required rather is discouraged as in case of subsequent start operation certain operation are skipped. It is possible to start driver more than once with different configuration in case we need to change driver configuration on-the-fly. Take a look to demos under the testhal folder and testex folders: in these demos you can find some precomposed configuration that you can copy and use in your application. As the configuration depends on hardware be sure to pick a demo for the subfamily you are currently using. You can take a look to the definition of configuration structure following the breadcrumbs: first you need to detect which LLD your platform is using through the platform.mk file, then you have to open the related low level driver header where you can find the configuration structure definition. Those fields which are related to hardware are described in the reference manual, use it to spot the meaning of each bit. Remember that the start function usually does some internal obvious modification to register values passed through the configuration. There are some simple techniques to change certain bit of the register leaving others unchanged. Such operation takes the name of bit-masking and the adopted paradigm to deal with registers read-modify-write. This is a knowledge you really should do have. If don’t I highly suggest to read this article (even at later moment). You do not have to define register bitmasks as they are already defined and available in CMSIS header files. You can find these files under the folder chibios182\os\common\ext\ST. This section contains a series of articles which are meant to be advanced: they will talk about a specific topic which often requires a broad knowledge about other subjects. Pick one and read, and if you like it don't forget to Share the knowledge!